The hidden evolution of the Tiltall may best be revealed peeking up its leggings and accoutrements. The concurrent StarD, far left, appears to have innovated a number of changes- some perhaps improvements, some probably "shortcuts" - that Unifot and the current KingHome continued. 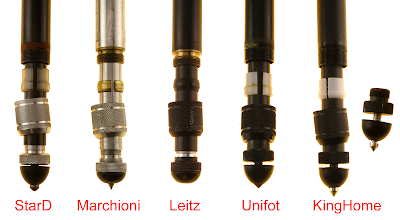 First, the foot - the descending rubber pad vs the descending metal spike of Marchioni and Leitz. StarD also used the plastic seize bushing vs the brass of Marchioni and, as noted below by Daniel Wong, Leitz switched from a brass seize bush initially to plastic bushing later on - see Daniel Wong's note/photo below. Also note the threading of the aluminium tube of the StarD vs the more expensive brass insert sleeve of Marchioni and Leitz also noted by Daniel Wong. Further evolutionary surmise - StarD offered a silver leg closure as Marchioni, but on a black painted finish. 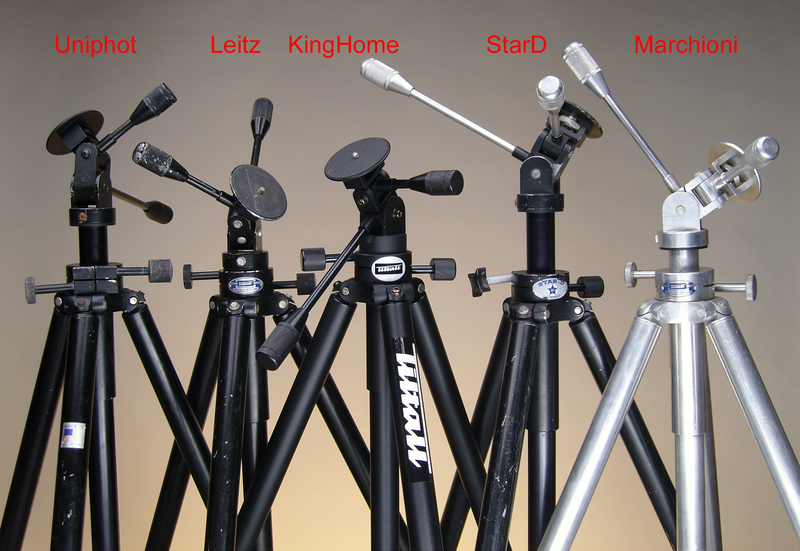 Leitz follows StarD, but Leitz eventually (see Daniel Wong) changes to a black leg closure, matching their black paint finish. This scheme was continued by Unifot and KingHome. Though KingHome presently offers black, silver and. . .sometimes gold. See Joe Farace's red/gold KingHome Tiltall below. IMPORTANT ORDERING NOTE (28Feb2010)- The KingHome iteration is, as indicated (click to enlarge), at the right of the photo above, and is the only version of the classic TILTALL presently in production to the knowledge of its owner, Oliver Yang and myself. So, not to belabor the obvious, but it follows that the only parts I can supply to you are the ones presently in production. 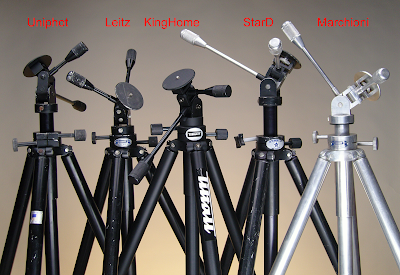 As example, if you have looking for a leg bushing, but you have a Leitz or Machioni TILTALL - best to watch EBay for a used Leitz or Machioni TILTALL for cannibalization, 'cause we have nada for you. Even a KingHome bush into a StarD "TILTALL' might need a mat knife and etc.